The Zenith A. Cairelli AMI CP-2 represents a high-water mark of effortless Italian style. In its period, Turin gave us the Type 33 Stradale, Quant gave the world the miniskirt, Florence gave us the true Vespa, and Zenith gave Italy’s Air Force the CP-2. All of the above mark high-water points as style icons. 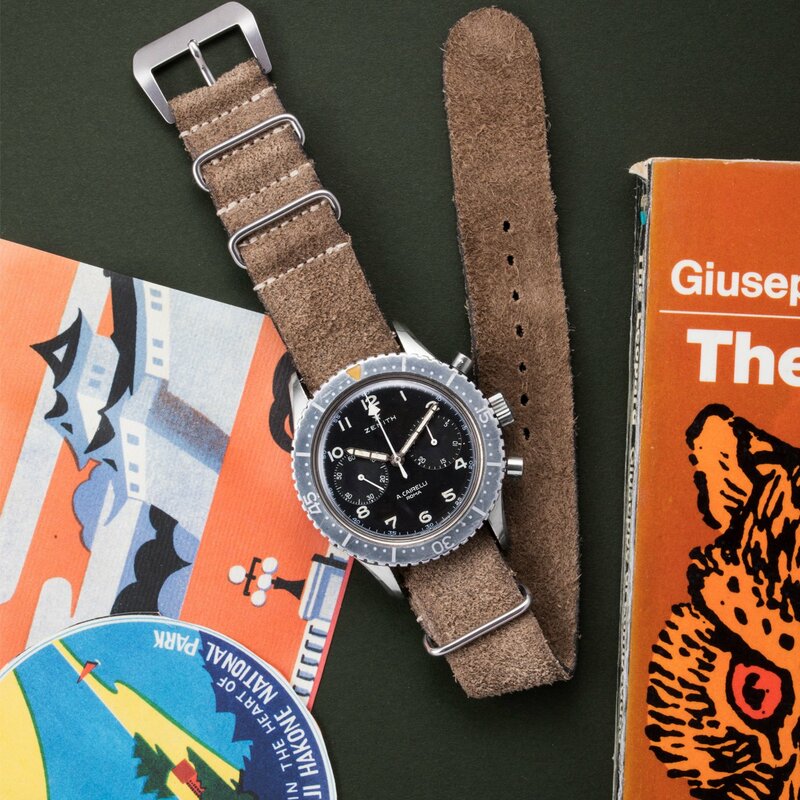 Succeeding the Breitling and Leonidas CP-1, Zenith employed a hand-wound 146 DP, based on the ebauche by Martel, later acquired by Zenith. The movement predates Zenith’s invention of the automatic caliber. That 146 DP powers a two-register dial layout that was designed purely for high-visibility under stress. That goal was accomplished in spades with clearly legible font and a unique hand shape. At 43mm, the case is muscular even by modern standards. It is estimated that 2500 were produced. They’re now becoming difficult to source. Originally designed for pure functionality, the CP-2 is now established as a choice pick for collectors—either of military or beauty. The example on offer today offers a unique worthy of note. The bezel is particularly ghosted, clearly worn, and its lumed triangle has gone deep orange. The unique hand-to-dial contrast often observed on these is very little. The case is unpolished and strong on the edges. Military markings on the case back are still clear today. The movement is remarkable clear of any patina. The overall report is strong, as is the market. These continue to rise in value and justly so. Find this Cairelli AMI CP-2 here for 17500 USD.